KISS Navy recruits, are you ready? The KISS Kruise V is hitting the high seas once again on Halloween 2015. 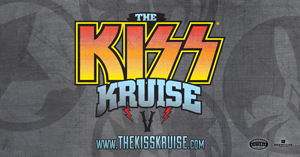 An updated website with details about the KISS Kruise V is now available, so be sure to check it out at thekisskruise.com. For 40 years, KISS has been in the business of rock and roll, recruiting legions of fans from all walks of life and every corner of the globe. The time has come to take on your next mission which will surely be the most epic adventure the high seas have ever seen... The KISS Kruise V! Gene Simmons, Paul Stanley, Tommy Thayer and Eric Singer will be sailing from Miami to Jamaica, October 30 – November 3, 2015 aboard Norwegian Pearl, the central hub for all KISS maniacs worldwide. They’re going back to the golden age when KISS rose to prominence, taking the world by storm. What better way to celebrate the rise of these rock legends than to watch KISS perform the very live album that launched them into greatness 40 years ago? Get ready to rock out to KISS playing their first gold album Alive! in its entirety. You read it right. KISS is playing Alive! from front to back during The KISS Kruise V indoor show. Year five has promised to bring new surprises and drive you wild and crazy. Book a cabin during the pre-sale and receive a limited edition KISS Kruise V t-shirt mailed to your door before the boat sails. Halloween is in the grasp of the KISS Navy once again. You know the drill; Shout It Out Loud on The KISS Kruise V! KISS will be inviting some of their favorite bands to join them for this adventure at sea! You can expect artists announcements throughout the year to round out this music festival, so count on your days to be filled with numerous shows, contests and activities.